Decision-Making Under Risk and Ambiguity. Doktorarbeit von Benjamin Albrecht, Verlag Dr. Kovač 2016, 154 S.
In our daily life, we have many things to decide. These decisions include more or less risk. Many situations where we have to decide between different options are financial decisions. Such financial decisions include the risk to lose or the possibility to win money. 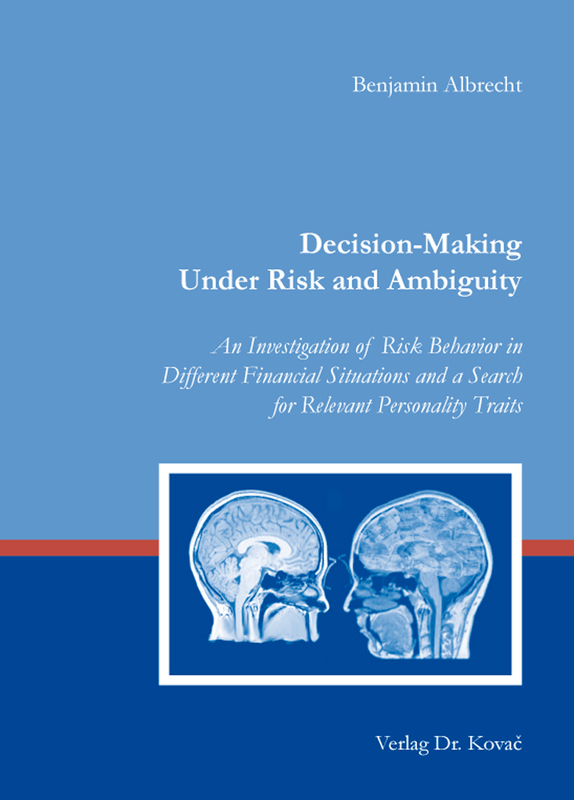 But what are the psychological factors which influence decisions in such financial situations Are there personality traits which make people take greater risks? Can we detect critical neuronal patterns which are related to riskier decisions with diagnostic methods like magnet resonance imaging? All these questions are dealt with in research on decision-making under risk and ambiguity, a part of the neuroeconomic discipline. With this book, the author shows some possible answers to these very complex questions and gives an introduction to the methods used in this research field.